I haven't ever been too impressed with the foam edge on the trailing edge of these foamboard models. I wondered, "hey, can I iron a TE into an airfoil?" You can do this. Moderate pressure on your sealing iron, a low-angle, medium-low heat, and profile both sides. Leaves a nice edge on the foam. If you are not careful, it can kind of bulge the foam towards the center of the wing or tailplane. I am getting ready to paint. The ship is missing several important pieces - I want to put radiators on the bottom, cannons, the gun ports and, of course, an exhaust stack on each side. I do not have a 3D printer. I may have to carve a stack out of balsa. I have re-flown the airframe in its current incarnation. 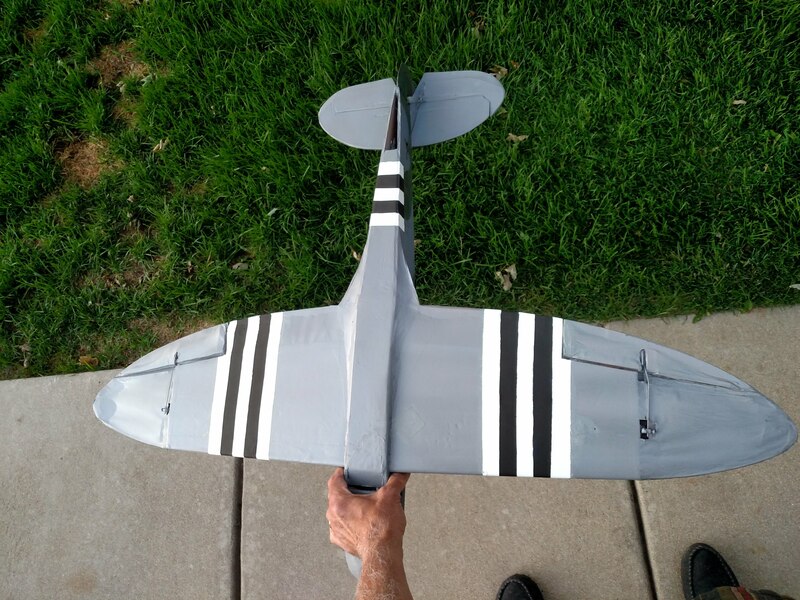 I was naturally worried about how I'd get it aloft with the fairings (it's harder to hold), and what the story would be with the new underwing structure and, of course, the 50 gram increase in noseweight due to the re-work of the mount (which is as solid as a rock now). I needn't have worried; performance is now excellent, with loads of penetration in Northern Colorado's high winds. Approach speed has increased and the aircraft may be a tiny bit more sensitive to roll moments. I will take her 3-mistakes high and get some stall departure training in. I would not be surprised to find it tumble and spin but I doubt it will be unrecoverable. I did get the ship to slow down pretty aggressively (but nothing like the old days). Mass is presently 997 grams. I imagine paint may add 100 grams or so. I also never got the hatch magnets to really link together, so I slotted out the front of the hatch and the front turtledeck, and hot-glued a wide tongue depressor into the hatch. Thank God for Dremels. 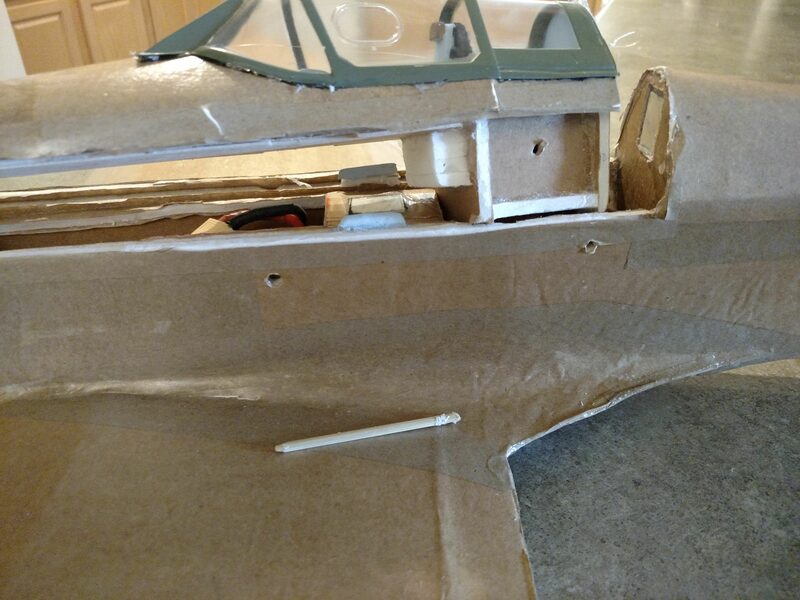 I use a pin through the fuselage and hatch at the rear to retain the lot, and have used transparent Gorilla tape behind the aft bulkhead and the windscreen to pull on the aft part of the hatch to gain access. Really looks great, the more photo's the better, we need a video next Have you decided on how you are going to paint it? Video will come after decoration. I will likely fly the ship at the weekly gathering of eagles at the local high school. 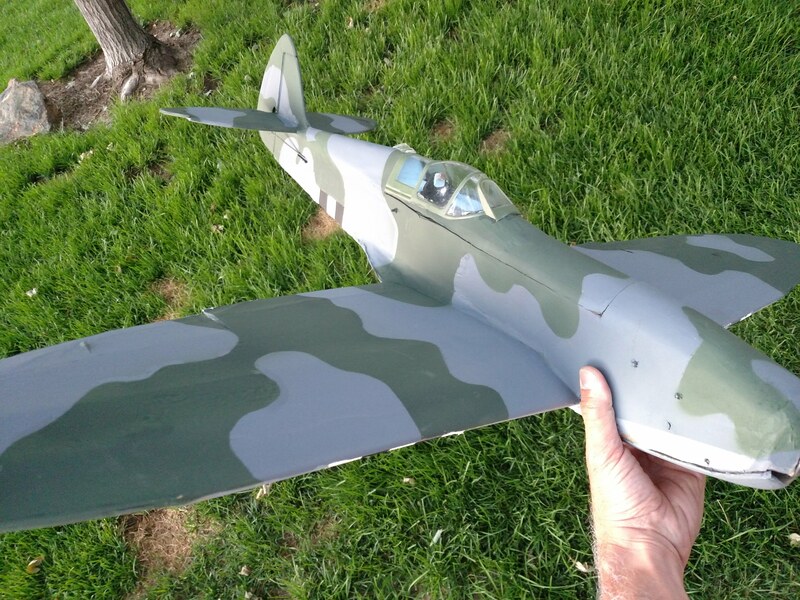 None of those old codgers (LOL) have a clue how to videotape an R/C model, and I am not comfortable attaching my little camera to such a new plane. 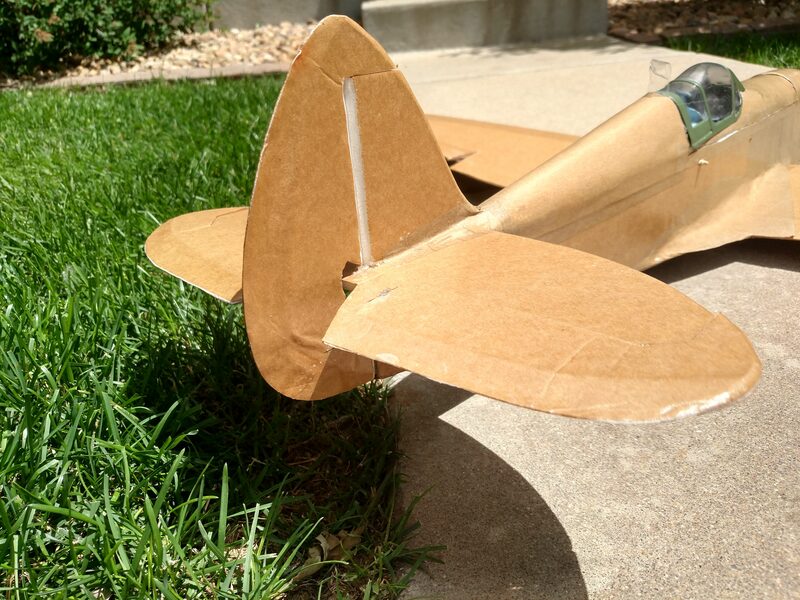 The second one i made weighed in about the same once the landing gear was removed (was nearly 1.2kg with retracts) and needed far more speed to stay in the air than the standard plane and lost that floaty feeling. Flew two batteries through the bird at the weekly flugtag at the school's soccer field. Had some trim adjustments and minor league issues, but finally got the ship flying gracefully. It still can crack over the turns and do nice rolls, loops and spin. Recovery from stall is nearly as forgiving as it ever was, despite the re-engineering of the wing. Now I have to apply camo and paint, in the glorious Ioannis Plagis's colors! Post flight check-up showed... washers. Then, a nut. "From whence we did this come?" I asked myself, doltishly. It came from my motor mount, which had vibrated the screws loose which secured the mount to the pod. Fortunately I was able to disassemble the pod despite a little hot glue I had used to lash the pod to the inside of the fuse. I failed to lock-tite my fasteners and two of the three departed the airframe, and the only remaining screw securing the mount was finger-tight. Not good! I found and installed new hardware, using blue lock-tite to prevent it from wobbling loose again. After reassembling the powerpod, I prepped the ship for paint. Last night I mixed up some acrylics to meet the spec paint scheme, masked the canopy, then shot the bottom of the airframe. Then, I shot the top. 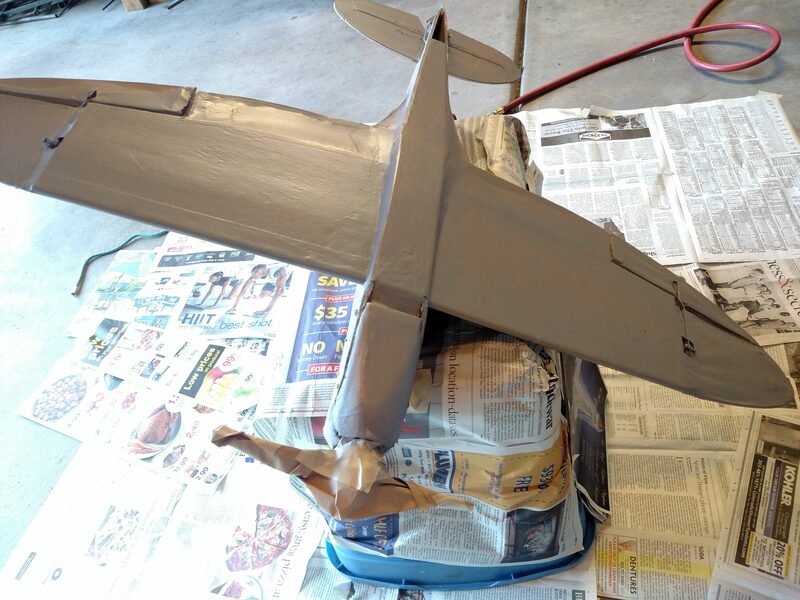 I have an airbrush, so this was an effective way to get color onto the airframe. I bought some frisket mask last week and will apply the mask on the gray areas. I'll shoot the dark green tomorrow morning. Later, I'll do the duck-egg green spinner and the band at the tail, then I'll shoot invasion stripes. 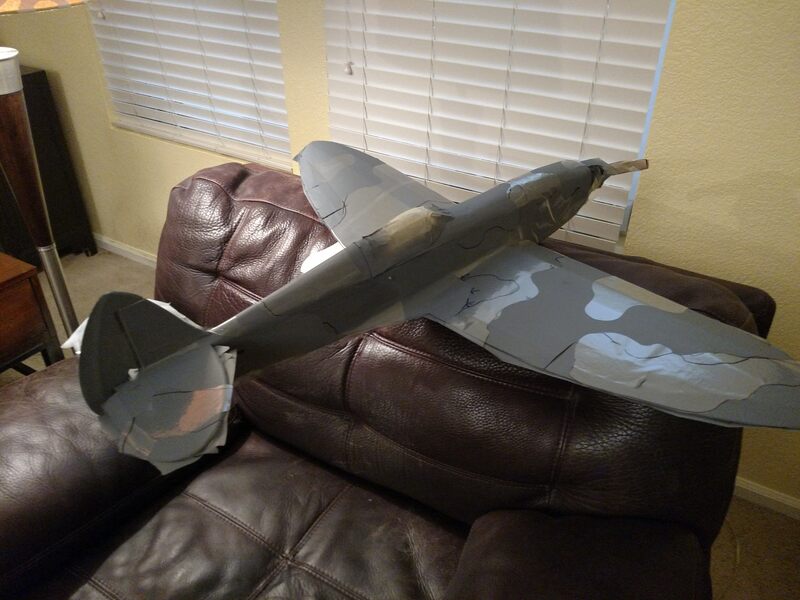 I think I have some ink-jet decal paper running around around the den, which I'll use to put roundels on the bird. 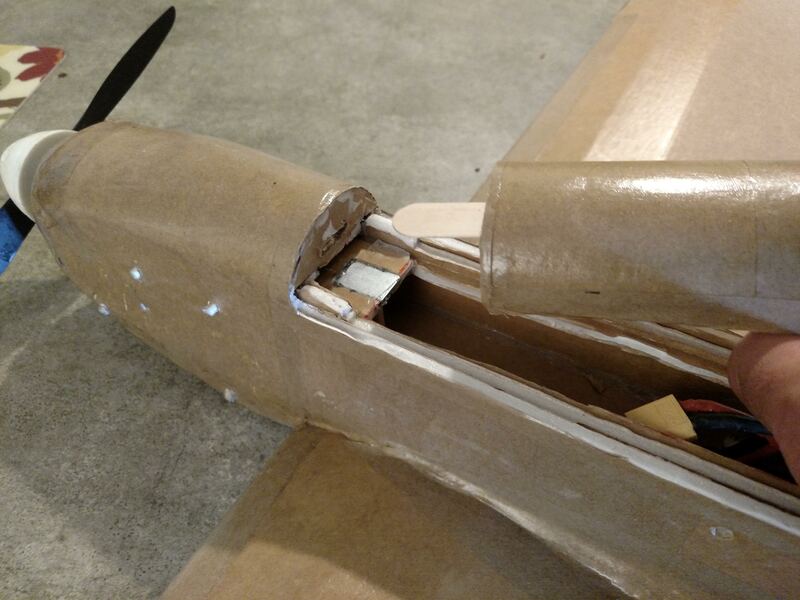 Item of note: Everything I've done that looks like an incompetent, drunken killer wielded a knife or a hammer SHOWS UP LIKE MAD when paint gets on the airframe. Every edge is raggedy, every wobbly line pops out at you like nobody's business. 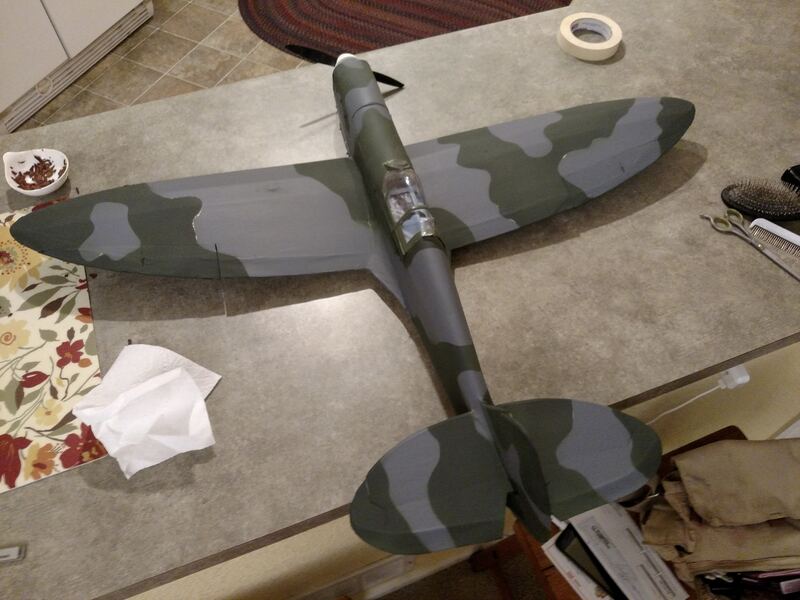 I am hoping that when I put the Dark Green on the airframe and get some decals on it won't look too horrible. As it sits it's looking better than a stock bird from 15 feet away, but it won't pass even a preliminary scale test. 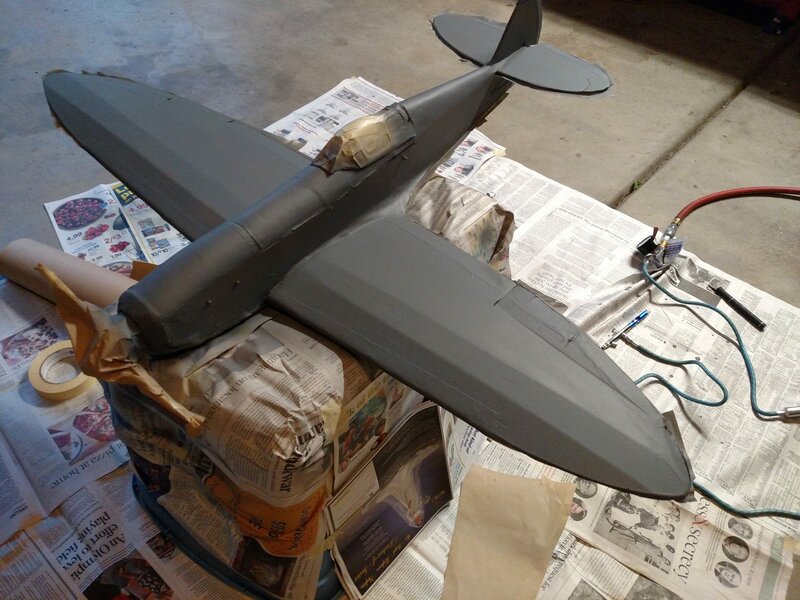 Things are looking up - I have masked and painted the camo on the bird. Today I will paint the duck-egg green color on the spinner and the band on the tail. I made up decals on some decal paper I bought about 8 years ago, and it's been sprayed with clear matte spray and will be applied after I paint the (narrow) invasion stripes. After painting, peeling off the mask. I've cleaned up the mask lines and the ship is looking much, much better. Invasion stripes painted on. Note to self and any other interested parties: When painting invasion stripes, don't bother to spray paint. Huge pain in the lower neck re-masking the ship with no visible payoff. Would have been fine to mask and brush paint. Tried applying waterslide decals - I forgot an essential piece of modeling knowledge here. You must use white decal paper for decals that are to be placed upon a dark surface. The decals are translucent and need a light background to work correctly. I'll examine Hobby Lobby's selection of inkjet-compatible papers tomorrow. I have painted the stripe at the tail the "duck-egg green" along with the spinner. Hand-painting worked just fine in this application. Paint is looking good, should look great in the sky. I finished mine off yesterday, paintings a bit rough but looks fine once up in the air. Bought some white vinyl that can be run through the inkjet I have upstairs. 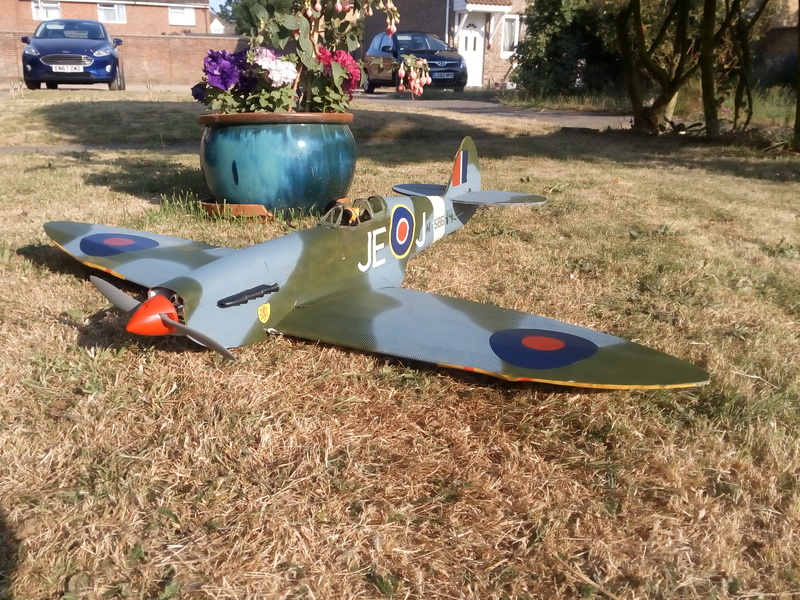 I figure that this is as good as it is on my Durafly Spitfire Mark Vb, and it looks superb. I'll give it a shot and post once applied. Should finish the whole affair this afternoon. The vinyl decals were not the best option. The vinyl is kind of thick, and the adhesive doesn't love the chalky surface of the flat acrylic. If I ever re-do this I will take a different tack - perhaps a white-backed decal paper. Anyway, the ship's in final acrylic coat, and the only detail that remains is the engine exhaust stacks. A wonderful member here is working with me on this. I'll post a movie in a few minutes of a walk-around of the aircraft.